It’s easy in this life to get frustrated, overwhelmed, stressed and saddened. Life is just so unpredictable and nothing is ever guaranteed! Illness, tragedy, trauma and death steal our dreams and break our hearts. How are we to cope? What are we to do to ease our pain? The answer to how we carry on has as much to do with our personality as it does our spiritual path. Some of us are quiet copers and treasure time alone to think, pray or journal. Others crave company and seek out others to council us, encourage us or hug us through our pain. BREATHE! Breathing has a direct biological effect on our mental, emotional, and physical state. Breathing relaxes us. Deep-breathing can lower our heart rate. Breathing gives us a chance to calm down and collect ourselves… getting our mind off our fears and obsessions by redirecting our focus onto the present moment. 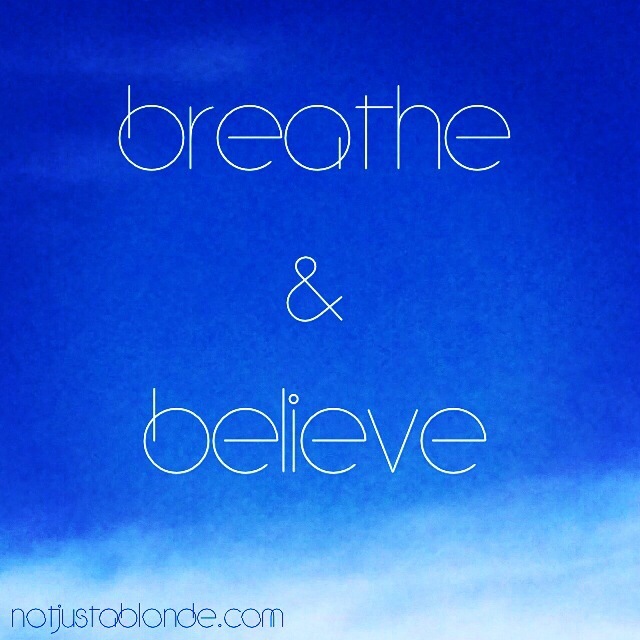 And the next word in this mantra… BELIEVE. Believing is a hope-filled act of Faith. Believe represents my belief in a Higher Power. I call this Higher Power: God. I believe God uses all things for our ultimate good. I believe that no matter the circumstances we are cared for by a living God of Love. The word BELIEVE represents all of this with the promise of better days ahead. Breathe and Believe everything will be all right… and you will find your Peace once again! I, too, do a little of both introverted coping as well as talking it out with others. Your breathing sounds like a movement into meditation, which is always good, even though some might view it as wrong. Meditation is merely the sitting alone in a quiet place with your mental focus on whatever Higher Power you believe in. It usually results in relaxation and I think in that state of mind, we are able to better analyze our situation and possibly alleviate the frustration/stress/sadness. Yes, I totally agree with you! Mindful breathing is the gateway towards meditation, something I do not do nearly enough! I need to do this much more than I do… I bet I’d find myself much more centered and less stressed!